Last week was a fun and new experience for me. I was able to go away on a short little trip for a very special event! It was nice to have a small break from routine and be in such a creative and inspiring atmosphere. I just finished going through all my photos last night, so I’m planning to blog all about that tomorrow. 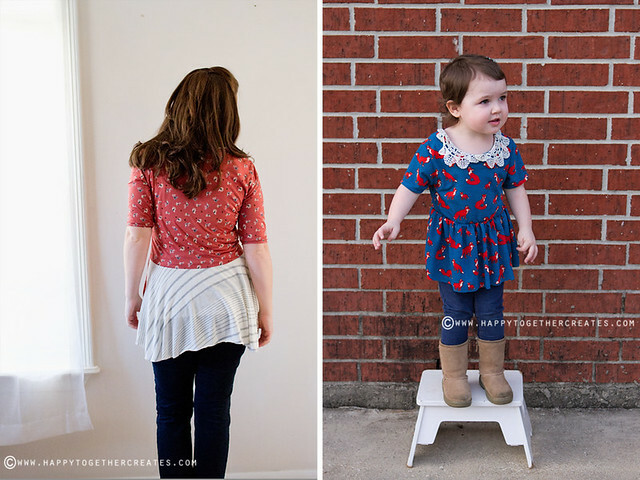 Today, I’m sharing a Penelope Peplum knit top (for women) and two Pippa Peplum knit tops (for the little ones) I made using this fabulous pattern by See Kate Sew. 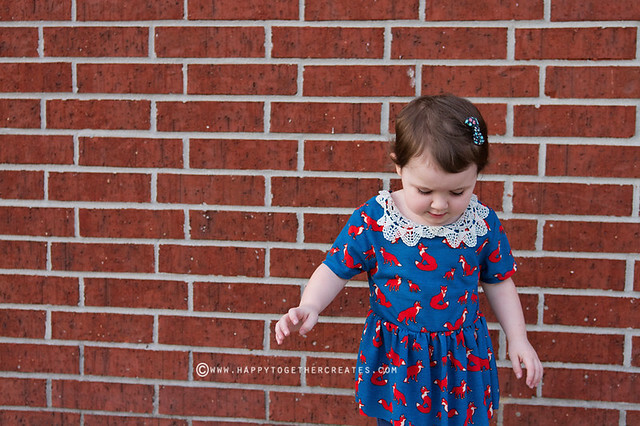 PS: There is also a circle skirt add on for the women’s pattern to make it into a dress here. 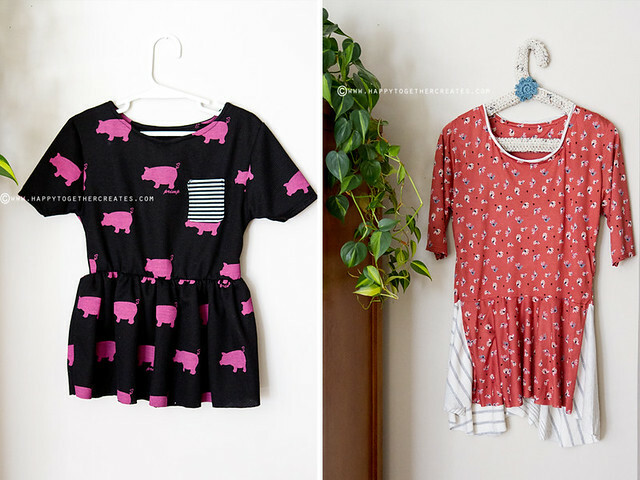 I have always adored Kate’s patterns, so I was more than happy to sew some of these up. I went knit fabric shopping online at Girl Charlee for my fabrics. 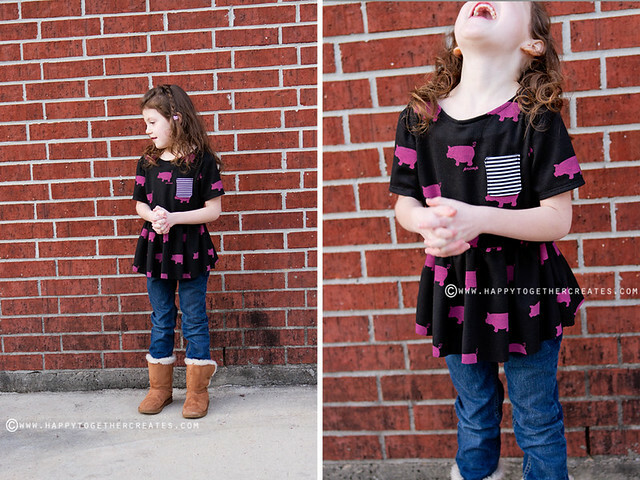 Miss J picked out the pig fabric. She’s still on her animal/farm kick and I love it. I can’t wait for the day I can get her some real animals to take care of. I picked out the foxes for miss E because she really likes that “what does the fox say” song, like most little ones. What is it about that song? lol. I picked this vintage inspired fabric. Typical me, right? 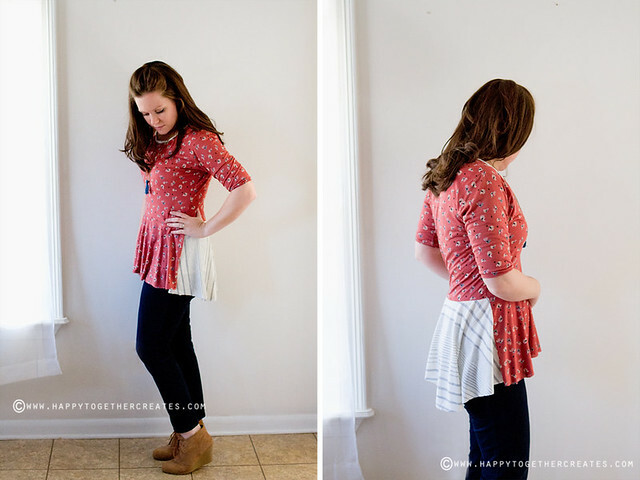 The shirt pattern has three different sleeve options: cap, bicep, or half sleeve. I did the bicep length. I also used the circle skirt add on for the bottom and sliced it up a bit so the back bottom fabric peeked around the front. I think that striped fabric was from a recent GC purchase as well, but don’t remember. It was in my stash. I kept the top with the same and just angled the sides when cutting to get this look. I also added a small fabric strip around the neckline inbetween the outer fabric and interfacing piece. I am happy with the fit and how the look turned out. I like how she suggests to use elastic thread where you sew on the bottom. It helps it have better stretch for when putting it on. I didn’t use it on mine, but I did for the girls. I wanted to see the difference. The next time I make one for me again I will try the elastic thread. I have a dress in mind with some lovely black stretchy lace in my stash. For miss E’s, I added a doily to the neck. I had one just the perfect size and cut it in half. I tacked it in place before sewing on the inner facing just like I did on mine with the fabric. I did the cap sleeve style on this one. I had to add a little something to miss J’s too, so we made a little pocket for it. 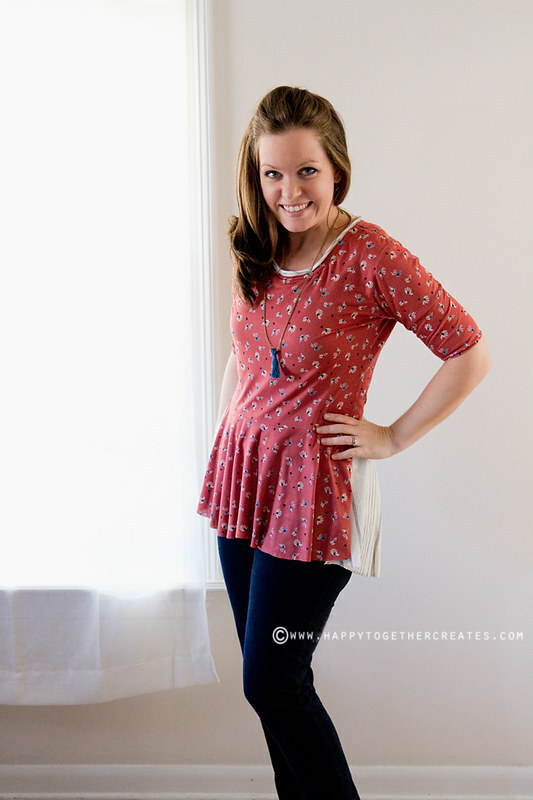 I would recommend this pattern for a quick and easy sew with a polished look. These are really cute! 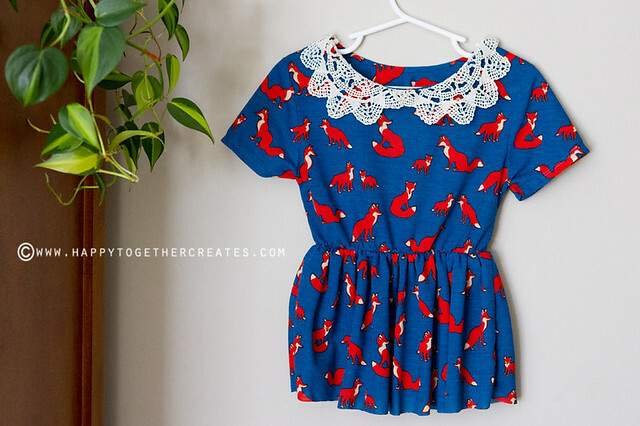 I love the fox fabric too! I just saw that the other day!! So cute! Love the fabrics, and great construction! Interfacing frightens me!